In July 2014 ICVL bought Rio Tinto Coal Mozambique's interest in the Benga mine along with its other exploration titles in Tete province of Mozambique for US$50 million. Coal from the mine is transported to Beira Port via the 660 kilometre-long Sena railway. The mine was initially proposed by Riversdale Mining, but the company's share in the joint venture was taken over by Rio Tinto in April 2011. At the time Rio Tinto stated that the "the Riversdale acquisition provides Rio Tinto with one of the world’s most prospective tier one coking coal developments. The growth prospects for the Riversdale assets are considerable. We remain optimistic about the outlook for the global coking coal market. This is a great opportunity for our business to deliver on the development of a large-scale coking coal resource". Rio Tinto stated that the Benga project had been granted a mining concession "with initial coal for export scheduled before the end of the year." The mine received government approval in January 2010 and reached commercial production in June 2012. In its 2012 annual report Rio Tinto stated that "commercial production in 2012 was 460 thousand tonnes. Near-term sales volumes will reflect the availability of rail and port capacity." The company reported that marketable reserves for the mine were 199 million tonnes in 2012". The mine is located just to the east of the Revubue River and Zambezi River junction. According to the former owner, Riversdale Mining, as of January 2011, the project includes 502 million tonnes of coal reserves with the first phase of the mine aimed at annual production of 5 million tonnes (run of mine). The first phase of the mine began to be commissioned in late 2011. The company has stated that full production for the mine could be 20 million tonnes per annum with hard coking coal production of 6 million tonnes and export thermal coal of 4 million tonnes. Associated with the project, Riversdale have proposed the construction of the Benga Power Plant, a 2000 megawatt coal-fired power station. (The company have proposed that stage one of the project would be 500MW with a later expansion contingent on the upgrading of the transmission line). In its 2006 annual report the company stated that in July 2006 it had purchased four separate tenements in the Lower Zambezi Coal Basin of Mozambique. "The tenements cover an area of approximately 203,000 hectares and represent a significant strategic holding in the Moatize Coal Province. This province is considered to be one of the largest known undeveloped coking and thermal coal regions in the world. Riversdale anticipates completing acquisition of the licences in Mozambique during September 2006. Riversdale will undertake an intensive exploration program on targeted tenements in Mozambique with a view to fast-tracking development of sustainable long-term mining operations, with an initial focus on metallurgical coal resources," the company reported. The company's primary focus was on the Benga licence area in the Moatize area which was adjoined by licences held by the Brazilian company, Companhia Vale do Rio Doce (CVRD). Riversdale reported that "a major feasibility study is being undertaken by CVRD to establish a major coal mine with associated rail and port facilities on its concessions containing 2.4 billion tonnes of coking and steaming coal. Based on geological evidence, the coal bearing series being mined at a nearby coal mine and intersected by CVRD on their licences extends across the Benga Licence. Coal outcrops on the Benga Licences, and data from drilling on each side of the Benga Licence, creates a strong likelihood of hard coking coal resources across these licences." The company stated that its initial intention was to develop plans for a 2 million tonne per annum export project. It also stated that "it is envisaged that further exploration will help identify thermal coal resources with a view to establishing the viability of local power stations." The U.S. Geological Survey reported in its 2007 survey of the Mozambique mining industry that "in December 2007, Riversdale Mining Ltd. of Australia announced the signing of a joint-venture agreement with Tata Steel Ltd. of India to develop a mine in the Moatize coalfield. Tata purchased a 35% share in the Benga and the Tete licenses that were held by Riverside. Resources at Benga were estimated to be about 1.23 billion metric tons." 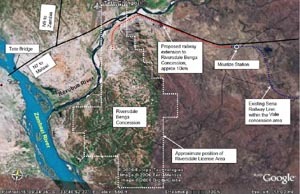 The Australian commodities forecasting agency, ABARE noted in March 2010 that "Riversdale is planning to develop the Benga project (3.3 million tonnes). However, because of the extent of development required (mining and infrastructure), export capacity is not assumed to be completely utilised" by 2015. In a December 2008 presentation to investors, Riversdale Mining outlined the licence area of the Benga coal project. (A larger more detailed version of the map can be accessed here). As part of the joint venture agreement, Tata Steel has committed to take 40% of the coking coal from the mine. A further 10% of the mine's output has been tentatively committed to Wuhan Iron and Steel Corporation (WISCO). As part of the mine development plan, Riversdale plan to relocate 500 families to a new village 50 kilometres from the mine site. In its 2010 annual report the company stated that as part of phase 1 of the mine "approximately 59 households need to be relocated ... Preparations for the relocation of the affected families are progressing well with construction of the host town at Mwaladzi on schedule. This follows official Government approval of the Riversdale Resettlement Action Plan (’RAP’) and the subsequent construction license approval by the Provincial Resettlement Committee. The Mwaladzi village will eventually accommodate in excess of 500 families relocated from the Benga concession area." In mid-January 2013 Rio Tinto announced that it had written off US$3 billion relating to Rio Tinto Coal Mozambique (RTCM) investments. In a media release Rio Tinto stated that "the development of infrastructure to support the coal assets is more challenging than Rio Tinto originally anticipated. Rio Tinto sought to transport coal by barge along the Zambezi River, but this option did not receive formal approvals.These infrastructure constraints, combined with a downward revision to estimates of recoverable coking coal volumes on the RTCM tenements, have led to a reassessment of the overall scale and ramp up schedule of RTCM, and consequently to the impairment announced today. Rio Tinto continues to engage with the Government of Mozambique on all transport infrastructure options." At the same time the company announced that it had sacked Tom Albanese over this and other write downs. (Doug Ritchie, "who led the acquisition and integration of the Mozambique coal assets in his previous role as Energy chief executive", was also sacked at the same time.) Rio Tinto chairman Jan du Plessis said in the media release that "the Rio Tinto Board fully acknowledges that a write-down of this scale in relation to the relatively recent Mozambique acquisition is unacceptable." ↑ Rio Tinro, "2012 Annual report", Rio Tinto, March 2013, page 31. ↑ Rio Tinro, "2012 Annual report", Rio Tinto, March 2013, page 51. ↑ 6.0 6.1 Steve Mallyon (Managing Director), "Mozambique's Role in the World of Coal", Riversdale Mining, Maputo, July 2010, page 14. ↑ Riversdale Mining, "Annual Report 2006, Riversdale Mining, September 2006, page 5. ↑ Riversdale Mining, "Annual Report 2010, Riversdale Mining, September 2010, page 14. ↑ 14.0 14.1 Rio Tinto, "Rio Tinto impairments and management changes", Media Release, January 17, 2013.